Happy Birthday to my best friend (and me too because, you know, we’re twins)! A few days ago, I celebrated my 27th birthday with my best friend. On my birthday, I assume super human powers, where calories fall to the wayside and I can eat whatever I want. Traditionally, Krissie and I go all out, selecting one Boston restaurant to get whatever ultimate chef’s tasting menu they can offer. This year, we went to Bistro Du Midi, which was out of this world phenomenal. It was such a memorable and special dinner. I couldn’t have imagined bettered. That being said, I took that night off and left my camera at home so I could fully enjoy myself. In spite of knowing about the onslaught of food coming that night, I decided I couldn’t forego the quick Vietnamese subs from the Bon Me food truck. I tried to evade it, but it intercepted me with its savory scents on my way to the parking garage. Damn it. Of all the Asian cuisines showcased in Boston, I probably eat Vietnamese food the least. After a very sad experience with pho, star anise is one of my natural born enemies as it turns out, it should come as no surprise when I detected its slight presence in my pho broth, I swore off pho for good. Such a shame since bottomless bowls of noodles sound like heaven on earth. Occasionally, I’ll have a hankering for a spring roll, but that’s usually when I’m not sober and am feeling like a true fatty mcfatterson. 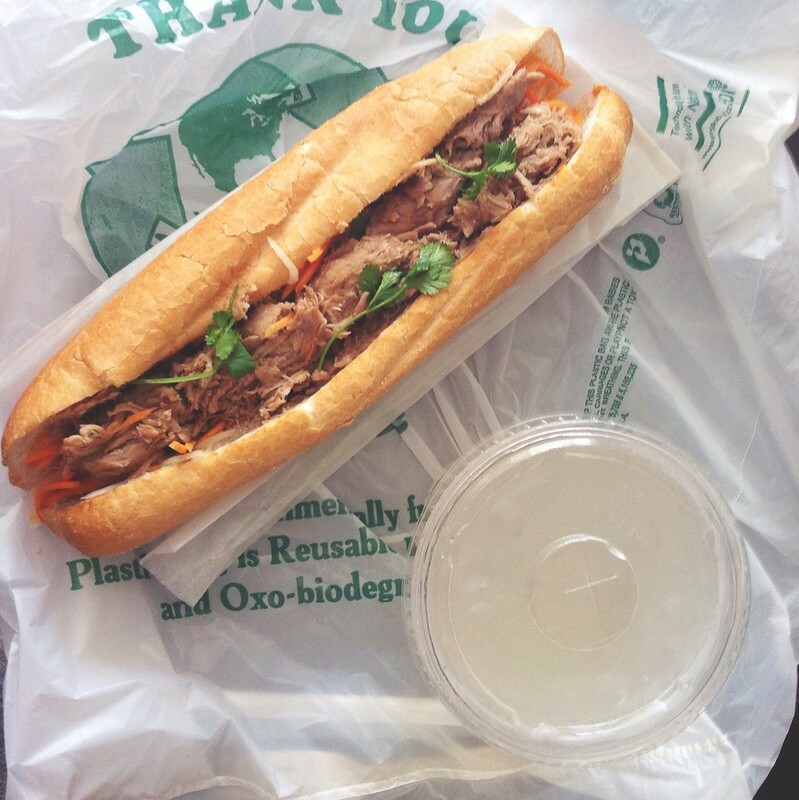 This past month, I’ve been craving bánh mì sandwiches often. For anyone who is unfamiliar with this wonderful treat, it is grilled meat (my favorite is pork), with mayo, pate (YUM! ), whole cilantro sprigs, fish sauce, pickled carrots and daikon, and hots. Miso braised pulled pork sandwich from the Bon Me Yellow Truck! I love this sandwich not just for its rich flavors and wonderfully tart carrot/daikon mix, but also for its history. 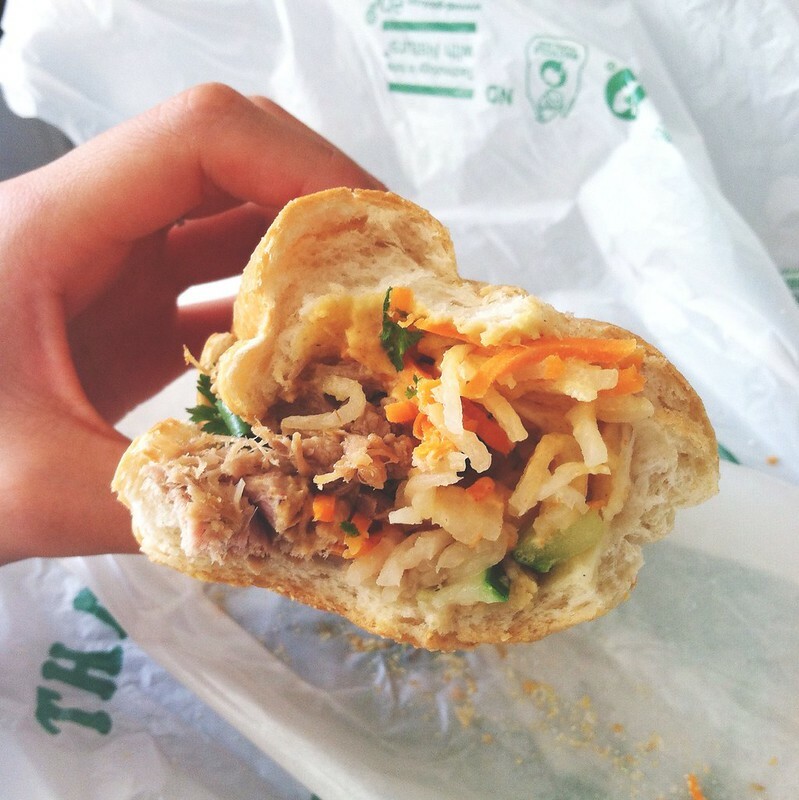 The sandwich showcases some of Vietnam’s French roots, and not that I’m necessarily all for colonization, I am for food fusion. I have a deep appreciation for flavors that change because of the times. Someone was innovative enough to think, let me mix what I have locally and throw some French lipids on it (pâté and mayo) and serve on a delicate French influenced baguette. Or maybe it was someone who had all this food on its way out and figured, Oh fine I’ll just throw it all on a piece of bread and deal with it. Whatever the case may be, thank you! You’ve given me the one Vietnamese dish that makes my heart sing.